RainSaucer - Where can I find those blue drums (and other food grade containers)? Where can I find those blue drums (and other food grade containers)? A customer recently wrote us asking for advice about how to find those 55 gallon blue drums (which are sometimes white, but blue is better for algae prevention). We understand the interest in these- they're durable, food-grade, stable in wind because of their cylinder shape, and already have the standard 2" NPT hole (check before you buy) making them easy to connect. The only issue with these drums is that they do no not nest with each other. So it makes them expensive to ship, forcing most folks to find them locally. 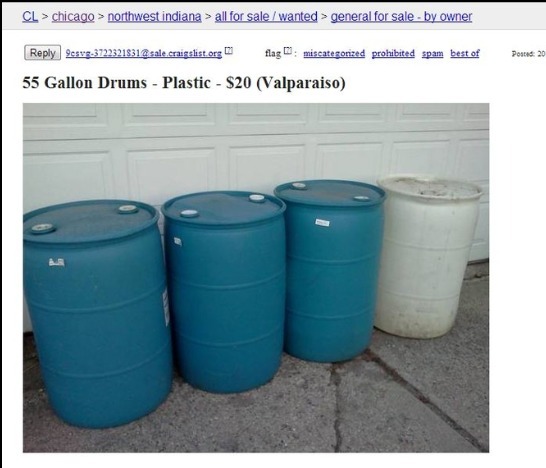 For used drums and barrels the best source is Craigslist*. You might have to try a few locations over a few days to get just what you want. Search on "55 gallon" or just "barrel" and your options will appear. $20 is the going rate from my research. Used drums and barrels are ideal for gardening as long as the container previously contained food. For new drums*: Both Costco and Sam's Club carry drums. Or if you have an emergency preparedness store somewhere in your area they would most likely have them. New drums are used for potable water storage. They can be used with our system for emergency drinking water but please note, unless the water will be consumed fresh after each rain event, we would recommend that you use a preservative and disinfect before consumption. This applies to any water storage not just rainwater. For new barrels: Rubbermaid's BRUTE line of containers that are the "round" type are food grade. They come in grey, yellow, and white colors and are certified to meet NSF standard #2 for "Food Equipment". Look for models 2610, 2620, 2632, 2643 and 2655, which hold 10, 20, 32, 43, and 55 gallons respectively. Home Depot and Wal-Mart both sell them. You can use a BRUTE for water storage but as mentioned above, preserve and disinfect if not consuming the water immediately. *Remember, If you are looking for a drum for a 59" RainSaucer, make sure to get one with a removable lid.